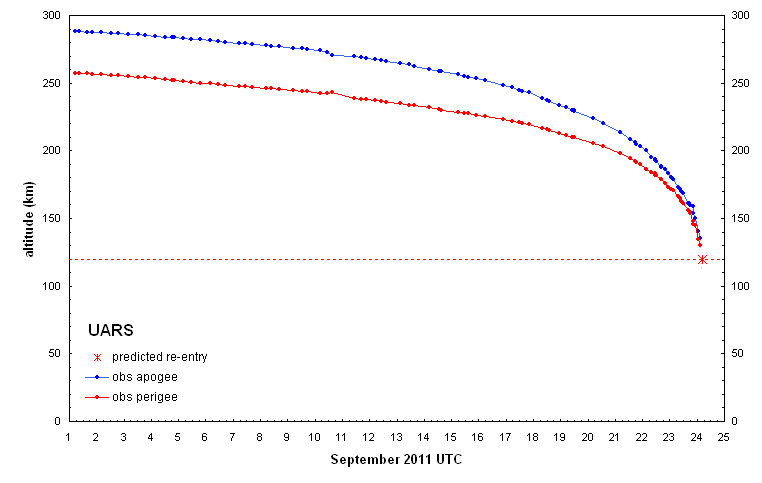 SatTrackCam Leiden (b)log: UARS update 24 Sept (2) - so where did it crash?!? 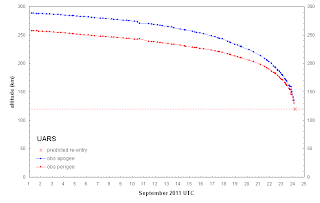 UARS update 24 Sept (2) - so where did it crash?!? 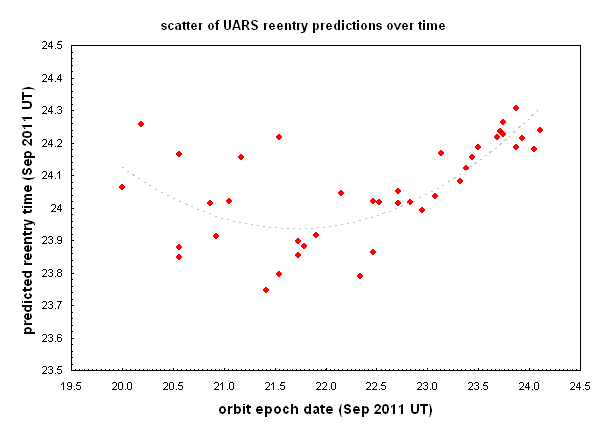 It is still not entirely clear where and when UARS met a fiery end. SSC issued a bulletin stating 4:16 +/- 53 minutes UTC. Harro Zimmer issued a final prediction of 4:15 +/- 9 minutes UTC. 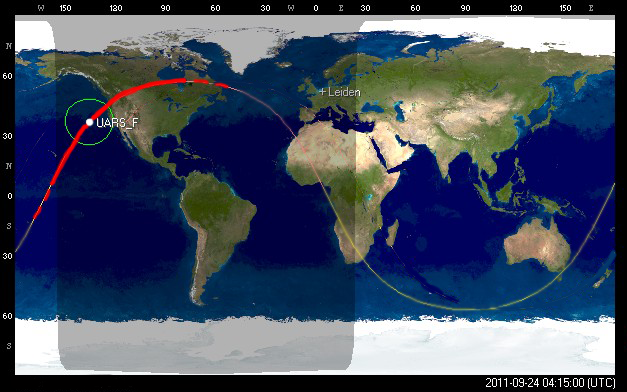 The latter would place the reentry over an area defined by the Northeast Pacific and northern Canada. 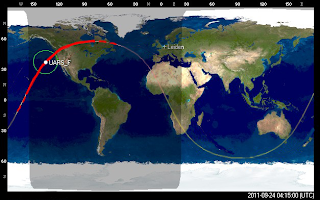 The problem is that the reentry was (according to a lack of reliable reports so far) not unambiguously observed, and probably that the last revolutions took UARS over areas (oceans and central Africa) where tracking stations are sparse. Perhaps the DoD might have space-based observations from their Infrared early warning satellites, but the question is whether those data will become public or not. Okotoks video - UARS or not? Meanwhile, a video from Okotoks, Alberta, Canada, hit the internet, purporting to show fireballs from the UARS reentry. However, to many people including me the video does not look right. We feel it looks more like a series of "Chinese lanterns", small toy hot air balloons. The individual "fragments" just don't show enough evolution over the video, they are too steady, amongst others (also, in the video the guy shooting it says it is "September 22nd", a wrong date). I could be wrong though, and the general geographic area is in line with the predictions. So while I don't want to write off the video completely, I do keep my reservations about it. UPDATE 11:25 UTC: there is now an UNCONFIRMED report of debris pieces having been found near where the video was taken. No details, no pictures, so could be bogus or mistake, no way to say.